The user has every possibility to create exactly the visualization he or she wants, with different layout options and personal backgrounds, icons and colors. xxter does not use an expensive or complex licensing model. This keeps the costs completely transparant. xxter supports extensive options to protect your security and privacy. All communications are encrypted. xxter installers can always count on the experienced, fluent English xpeaking support. xxter supports extensive security options to protect your security and privacy. Do you want to increase the possibilities of the electrical installation of your home or office or make your smart home even smarter? Then ask your installer about the possibilities of xxter. For people that have no home automation specialist, we are happy to have one of our partners in your neighbourhood contact you for an informational meeting or a quotation. The core of the xxter installation is the xxter unit, which is placed in your home. The xxter unit will be permanently connected to your home automation system and your home network. Because xxter works with professional home automation systems like KNX and enOcean, xxter is less suited for the do-it-yourself user. The installer will handle the technical installation, after which you can easily adapt all other settings to your liking, using "My xxter". In the free app, demo profiles are built-in so you can try the different possibilities of xxter yourself. You can try all the control options, the scenarios and the scheduler. Download the app now and see what xxter could offer for you. By using your own background images, custom icons and color schemes, you can alter a profile and completely personalize it. This can easily be done online with the help of the “My xxter” web portal. Additionally we offer several default profiles to create a beautiful visualization even faster. Users can change and customize their own visualization through “My xxter” themselves. Simply add pages, move components or change texts, everything can be done by the end user. Setting up the app has been made very user friendly with the QR code scanner. 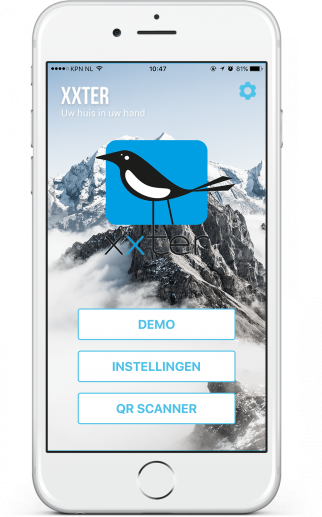 By scanning a personal QR code the end user can directly set up the xxter device in the app and choose his or her selfmade profile, without any help from the installer. xxter has set the new standard for the ease of use for scenarios. The end user can create and change scenarios himself directly in the app and control for every scenario which lights should be turned on or off or should be dimmed. The user is completely free to configure the scenario the way he or she prefers, which has never been possible before. Scenarios can be linked to light switches in the automated home by the installer, which allows the scenarios to be used directly in the home installation. Also curtains, thermostats and other equipment like the Sonos system or Philips Hue lights can be included in a scenario. The user can change scenarios without the help of the installer and can always see the effect of a specific scenario. Of course, scenarios can also be used directly in the app. The scheduler enables you to have specific actions activated at specified times. This could be an outside lamp for instance, which is switched on or off, but also a call of a scenario, the setting of a thermostat mode or the closing of the curtains in the evening, when it gets dark. Apart from the basic scheduler it is also possible to create an extensive day or week scheduler, wherein multiple actions can be scheduled based on time or on the sunrise/sunset. All these settings can easily be changed by the end user with the app. With the presence simulation of xxter you can allow recorded actions to be played back when the occupant is away, to make it seen someone is at home. The user can simply select which elements in the home should be recorded in the simulation. Then, through an option in the visualization or from the home installation (for instance (de)activating the alarm system), the playback of the recorded actions can be started or stoped. And whenever the pattern of the occupant changes, the simulation will always automatically change too. The alert service allows you to send messages from the installation to the user. For example, send a sms/text message when there is a frost risk or a leakage, send a monthly email with the latest meter readings or send a push message when the doorbell rings. Push messages can be sent together with a snapshot of a camera, to allow the user to always see who is in front of the door. The alert service can of course also be used and set up by the end user. If you have a permanent internet connection, you can also use xxter when you aren't at home. With the 'connect service', a paid service from xxter, you can use the xxter app to securely control your home or office without the need for any configuration of your router. You can even watch your cameras without making them available to the Internet. You can purchase the xxter connect service subscription from the service store in the app as a monthly or yearly renewable subscription. As an alternative you can also use 'port forwarding' to make your xxter available. xxter uses the latest encryption techniques, so you can be sure that you can use xxter securely, where ever you are. In addition to electrical installations, audio and video equipment can also be controlled with xxter. Control your audio receiver with for example uPnP, which is used by Sonos, or send infrared or RS232 signals with Global Caché to control your other equipment. Turn off all audio/video equipment when leaving your home or when going to sleep. Set the volume of your television to a preset level when selecting a scenario. Even the selection of a radio channel or favorite playlist when coming home is possible. xxter also supports HTTP and TCP commands, for instance for selecting a camera feed on your network equipment. TCP-commands for Denon and Marantz, e.g. The built-in data analyzer automatically generates and calculates statistics and information about any components you want to monitor. This can be set up without any difficult settings, after which the data can be shown in all kinds of charts in the app. Monitor the temperature of your central heating and display a chart of the last couple of days, weeks or months. How much electricity have your sun collectors produced? Monitor average values, maxima, minima or totals. xxter collects, monitors and analyses all of them easily. The xxter basic pricing depends on your current electrical installation. Your installer or smart home specialist can place an xxter quickly, so you will have no unpleasant surprises with the installation costs. You can use the xxter free app on as much devices as you want and as often as you want. Ask your installer what xxter could mean for you. For people that have no home automation specialist, we are happy to have one of our partners in your neighbourhood contact you for an informational meeting or a quotation.